People are forever incredulous that time passes. First of the month, last of the year, that sort of thing. “I can’t believe it’s July 1!” Well, I can. The first half of the year stomped merrily on (my face) and hallo July! Every year, my expectations for June are high; I have a compulsion to slow down, enjoy, and savor – June seems as good a time as any to start that. Instead, that month always seems to ooze and pelt rather than bust out. 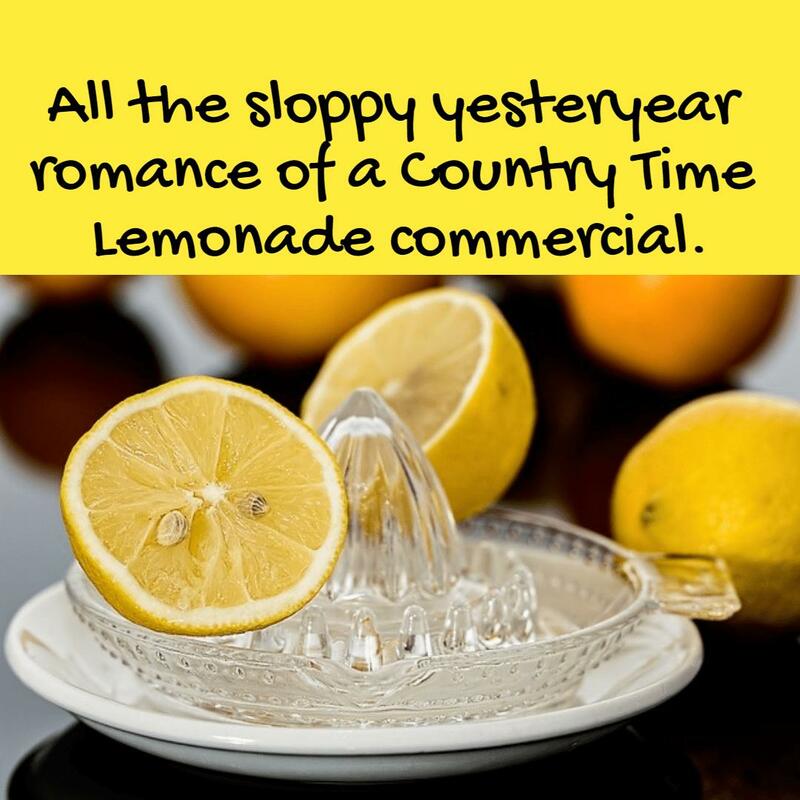 I want life in June to revolve around the outdoors and fireflies and porch swings – all the sloppy yesteryear romance of a Country Time Lemonade commercial. Somehow that hasn’t quite happened. Not yet at least. Yesterday I made a Nutella pie which I wanted stick my face in and eat in cartoon fashion, ending with my tongue coming out of my mouth and licking my entire head clean. Evolution needs catch up to cartoon sometime soon. I just deleted 109 emails in my draft folder, some going back to 2015. That counts as exercise right? Or some sort of cleanse? A least some sort of tribute to my being able to hold my tongue. The dog has his ups and downs, but is not in pain. He’s just tired a lot, with occasional spurts of energy. He likes to protect us from the Very Bad Squirrels in the backyard. Good boy. Writing is a bit of a slog these days, mostly because I’ve got a lot of first drafts. The rewriting and editing process is where I get bogged down in the self-defeating talk. My goal is to stay the course with a number of pieces I’ve been working on. I’m also trying to find a home for some of my writing. Humor has fewer homes, but, boy, are they sweet. I’m thinking a lot these days about social media/instant communication and how it affects personal relationships. One of the things I wonder about is the discrepancy between real-life interactions and online interactions – but not the way we normally discuss. Usually, the implication is that we behave badly online, in ways we would never think of acting in person. But what about the opposite? What if people are lovely and kind online, then not so much in person? There are some interesting facets to this that I want to hold up to the light for a while. One of the highlights of my month was getting to see a rough cut of the short film I co-wrote and produced. Over the next few weeks, final edits will be made, music added, color adjusted, and the production company logo will be created and animated. It’s all quite (sur)real and wonderful. I’ll be sharing more about that in coming weeks. I was surprised at how much I enjoyed seeing the cast again. We only worked together for a few days, but there is something about creating together that makes for bonds that are quick and warm. I do hope to work with these people again. They are good in every way. 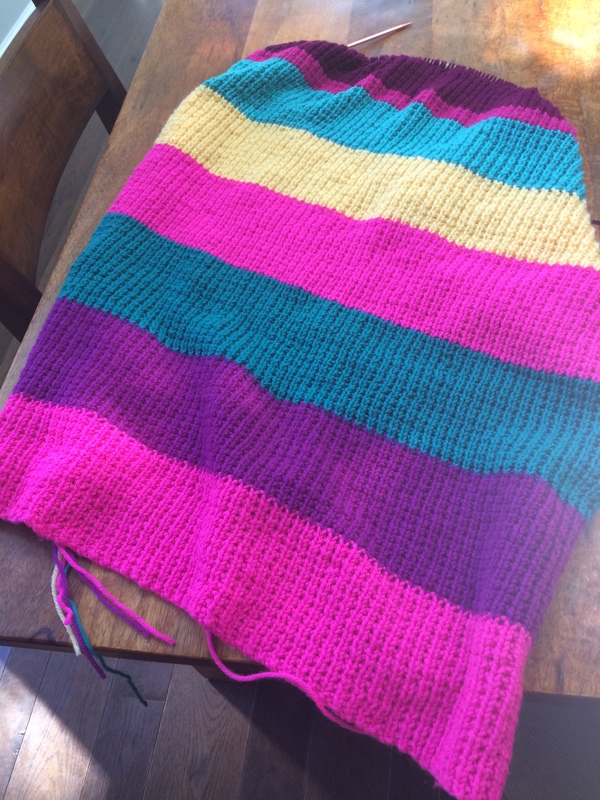 The knitting of The Blanket That Will Kill Me continues. I’m hoping to get this done before she goes to college in 13 years. On the positive side, it’s always nice to review how many swear words I know. I really enjoyed reading Originals: How Nonconformists Move the World by Adam Grant. I don’t have a business background, so my guess is some of the material covered in the book is shared in many MBA programs. But it was an interesting look at creativity and risk-taking. Do you read Glimmer Train? You should. I love this video. It’s joyful, it’s fluid, and it’s remarkably calming. Binge-watched Neil Gaiman’s American Gods. Rarely have I ever seen a show with such beautiful art design. There’s a lot to unpack in the first eight episodes, but I’m glad I found it and thrilled I watched it. I will be back for Season Two, but until then, I will probably spoil myself (ha!) and read the book. Ever on top of things, I finally got around to watching Inception. At least I think I watched it. Maybe somebody’s just convincing me I did. I thought Captain Fantastic was going to be some type of superhero movie. And in a way it was. I love art that makes my heart hurt from its beauty and gives me the sense that the world is full of genius. That, for me, is hope – something we could all use a little more of these days. I suppose I should and with some sort of fireworks analogy or maybe something about mosquito bites or whatever July is supposed to bring. I think the best hope is that July is more like the June of our desires.